Margaret speaks with us about her work which is inspired by a topic that got thrown under the bus this election season: climate change. "Understanding the cycles of life are core concepts in my practice. Ideas regarding vulnerability, growth, strength, powerlessness and transformation fuel my imagination and stimulate the creative process." 8 x 96 x 96"
Growing up in Canada on a one acre island must have had quite the influence on who you are today and the art that you make. When did you first realize the planet was something to be concerned about? Lake Muskoka, like many Canadian lakes was created by the last ice age. It is very deep and one of Ontario’s most beautiful lakes. The islands are made of granite and the underwater terrain surrounding the islands is made up of huge boulders and rocks. For me, it was a kind of underwater fantasy land. As a little girl, I remember looking down at least fifteen to twenty feet into the water that had an almost crystalline clarity. Sadly, by the time I was 32 years old, the lake had undergone an obvious change. I could no longer see the bottom with the same degree of clarity and all the rocks were covered with a layer of algae. I was profoundly saddened and I believe this was probably the time that I became passionate about preserving the planet. ​When did you first start working with Plexiglas and what process did you first use on or with Plexiglas? I started working with plexiglas in 1996. Initially, I was seeking a material that I could paint and draw on with almost any media and most importantly did not need to be covered with glass for long term protection. (ie. 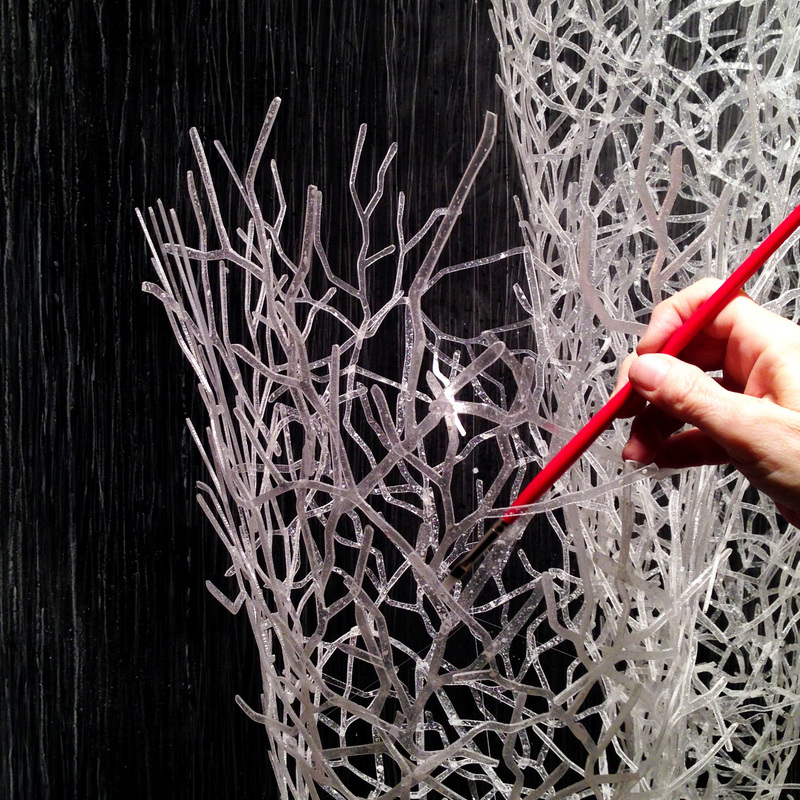 paper must be protected, glass placed over artworks compromises the tactile experience). By altering the surface texture, I discovered that the plexiglas received almost every media; I could apply oil paint, oil pastels, acrylic paint and prismacolor pencils just to name a few. Furthermore, I started painting/drawing on both sides of the plexiglas and that was transformative for me and it looked exactly like looking through water or mist. What other materials have you experimented with? In the early eighties I owned an etching press and worked for several years in this media. I experimented with cutting the zinc plates into shapes that I would etch. Sometimes these plates joined together like jig saw puzzle pieces when positioned on the printing paper. It was a kind of eureka moment for me as I realized that I could also cut wood into similar but much larger shapes and paint on them. Working with both a band saw and jig saw I worked for about twelve years and created both 2D and 3D wood forms that I painted and collaged. This is important as I continued to use a band saw, a router and a dremel tool in fabricating the plexiglas. ​What other tools do you use? I also use electric sanders, a jointer, a table saw and heat guns. I have used a propane torch but not very frequently. Most recently I have been using metal shears to cut very thin sheets of polycarbonate. 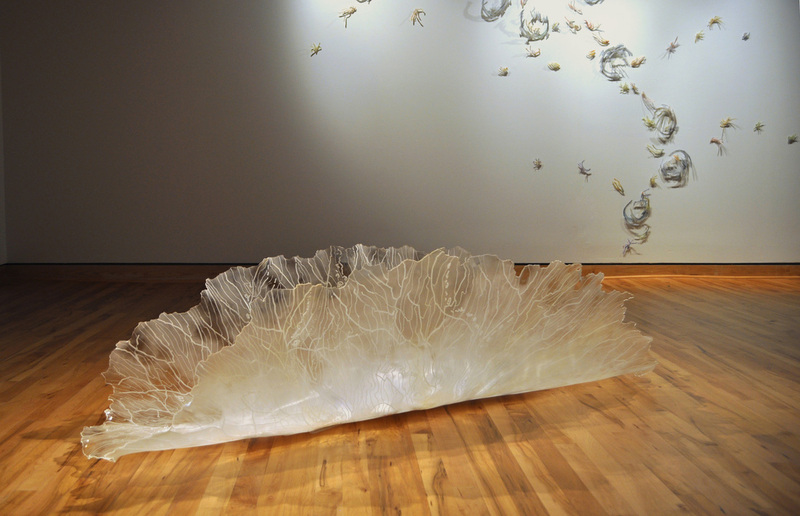 "The glass-like transparency of Plexiglas provides a perfect metaphor for my primary conceptual focus: the fragility of life on the planet and the vulnerability of the planet itself." What kind of research comes with creating works that present a moment in time in regards to the environment and climate change? I have always tried to learn about the natural world and how it is impacted by humans. I’ve gone through periods where my work referenced endangered species and other times it focused on forests and ecosystems. I have traveled and hiked in many National Parks both in the United States and abroad. Experiencing the natural world first hand is truly the best teacher. Your earliest works started on poplar wood and canvas and the colors were more saturated. How has your work evolved since you started creating? In my twenties I abandoned canvas because I felt I had more creative possibilities working with wood. I fabricated and laminated wood into 2D and 3D shapes inspired by boats, wings, ladders, portals, and growth forms. I was fascinated by the narrative of journeys and cycles. Eventually, I made wood paintings with doors that opened to reveal other paintings within. This is when I began experimenting with plexiglas. Plexiglas has amazing possibilities. Besides painting and drawing on both sides of this material, I cut it into shapes, alter the shapes into forms through heat, join the units together chemically. In the last five years I have focused on creating installations that incorporate both wall, ceiling and floor. Tell me a bit about your transition from paintings on Plexiglas to Spatial artworks. ​Having experience with sculptural paintings on wood provided a natural transition from the plexiglas wall installations to the fully three dimensional artworks.The potential of incorporating the floor and ceiling into the conceptual narrative presented a really exciting challenge. I have always been drawn to artworks that create a kind of theater that stimulate the senses on many levels. How have you pushed the potential of Plexiglas? You’ve created paintings, cut the material out in various shapes and hung them from ceilings and walls. How has its flexibility helped in the manifestations of concepts? -Altering the surface to receive diverse kinds of media or collage application. -Incising the surface to create the appearance of engraved lines and textures similar to effects on metal plates in print making. -Applying heat to alter the shape and surface the material. -Cutting it into shapes and very delicate line like forms. -Chemically bonding the forms together to make more complex and often very large sculptural artworks. The glass-like transparency of Plexiglas provides a perfect metaphor for my primary conceptual focus: the fragility of life on the planet and the vulnerability of the planet itself. Life Lines moves off the canvas as it hangs on the wall. Tell me about the process of creating this piece. ​Life Lines, explores notions of both birth and death. 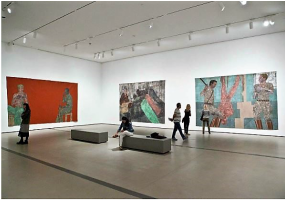 It is also a good example of a classic rectangular painting transitioning into a boarder narrative by using the wall to expand the field of the painting. This artwork also uses fiber. Using different colors of thread, I stitched through the Plexiglas and around some of the forms to underscore the concept of life bound together and life that has broken away. Many of the threads hang loosely around the “falling” detached shapes. 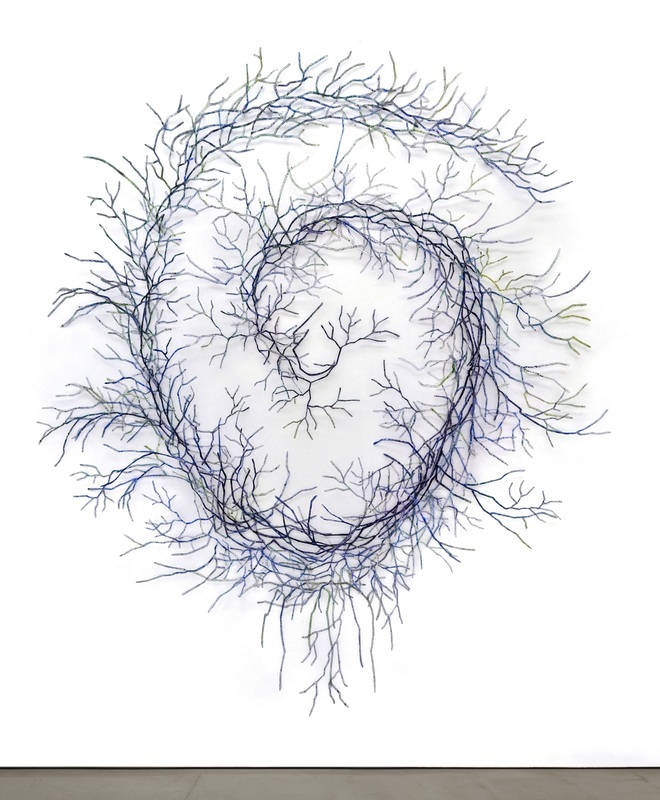 I thought of umbilical cords, nests, germination, and the final and ultimate breaking away of death. "I have always tried to learn about the natural world and how it is impacted by humans... I have traveled and hiked in many National Parks both in the United States and abroad. Experiencing the natural world first hand is truly the best teacher." 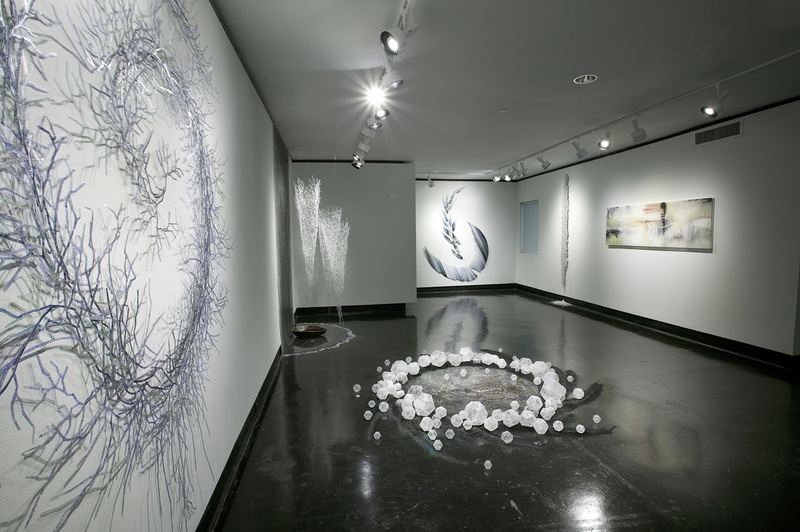 Tell me about Tumble and the moment in time that inspired this installation. ​Tumble explores two delicate relationships; it explores life forms existing in the desert and their desperate need of water and it explores species that have limited means of locomotion for survival. When both of these conditions are present, existence is precarious. I decided to create structures that somewhat resemble tumble weed to exemplify this concept. I imagined these rotating glass-like structures being buffeted about by the wind and thought it made a perfect metaphor. But it was when I was invited to have a solo exhibition at the Galveston Art Center, a museum space with eighteen foot ceilings, that this art installation really got underway. I created fifteen structures that rose about 14 feet from the floor. These forms also rotate as they catch the slightest air currents and cast swirling shadows on the adjacent walls. 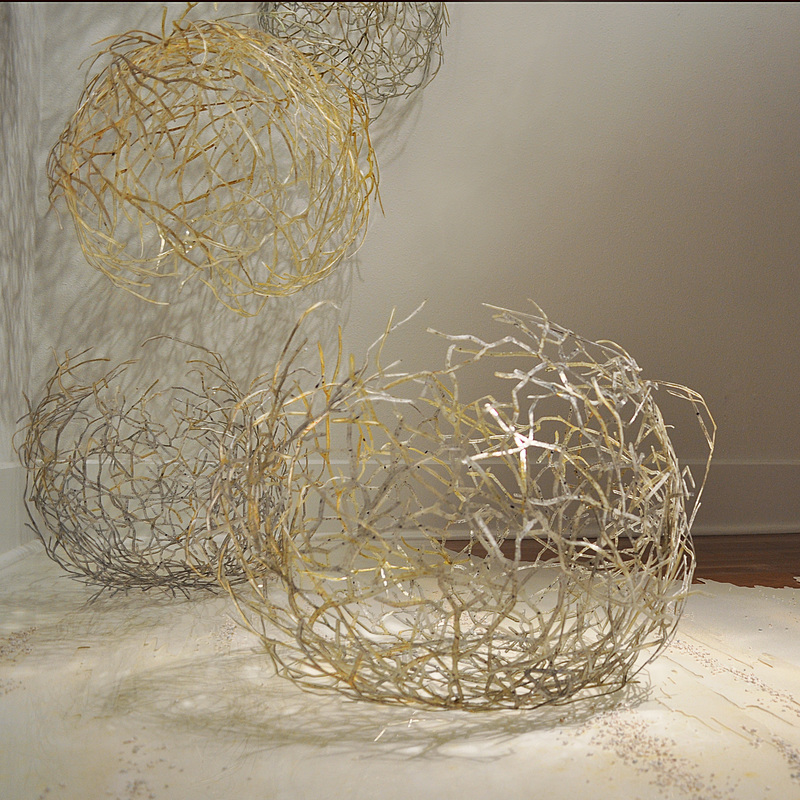 Your installations have a lot of movement, representing the concerns you have for the planet. Tell me about Full Circle and what it represents. 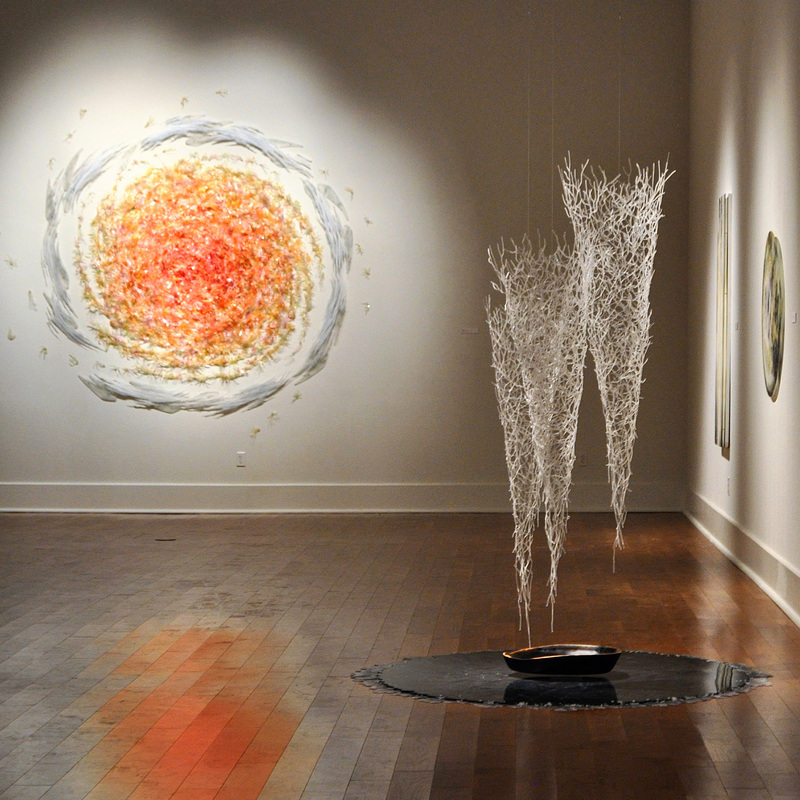 ​Full Circle, explores conditions of emergence, decay and death in things as large as stars or as small as molecules. ​I began by creating a circular plexiglas flat floor form and painted the reverse side to resemble dark water or the nebula of outer space. Then, I surrounded the perimeter of this form with very shiny black sand that spirals out like the bands of a galaxy. 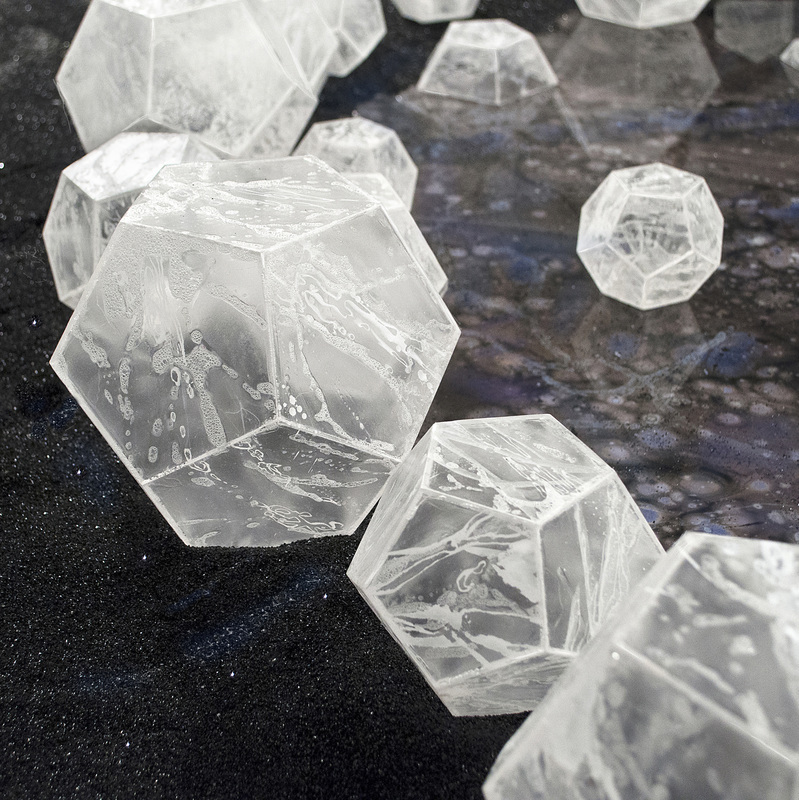 I fabricated over 125 plexiglas dodecahedrons that also form a ring around the central floor form and spin out in trajectories that follow the sand. Some of these crystal-like structures emerge out of the sand and some appear to be imploding or decaying. The structure of a dodecahedron is found everywhere in nature. Carbon molecules are basically dodecahedrons and are essential for life on this planet. You’ve spent time in Guam teaching. Tell me about your experience there and what you look forward to on your next trip, to Costa Rica this year. I lived in Guam as a young woman for two years and taught art, music and literature. My school was built on top of a cliff with a stunning view of the Pacific. The school’s property was adjacent to the governor’s estate and the teachers were permitted private access to the beach below. We had to descend the cliff, often resorting to cutting through the thick foliage with machetes. Generally, we were completely alone there and the beach and reefs were pristine. When the tide was out, the vast coral reef was exposed. It was like a living marine laboratory. The experience has greatly influence my work. ​In Costa Rica, I will visit many National Parks in the rain forests, cloud forests and on the Pacific coast. 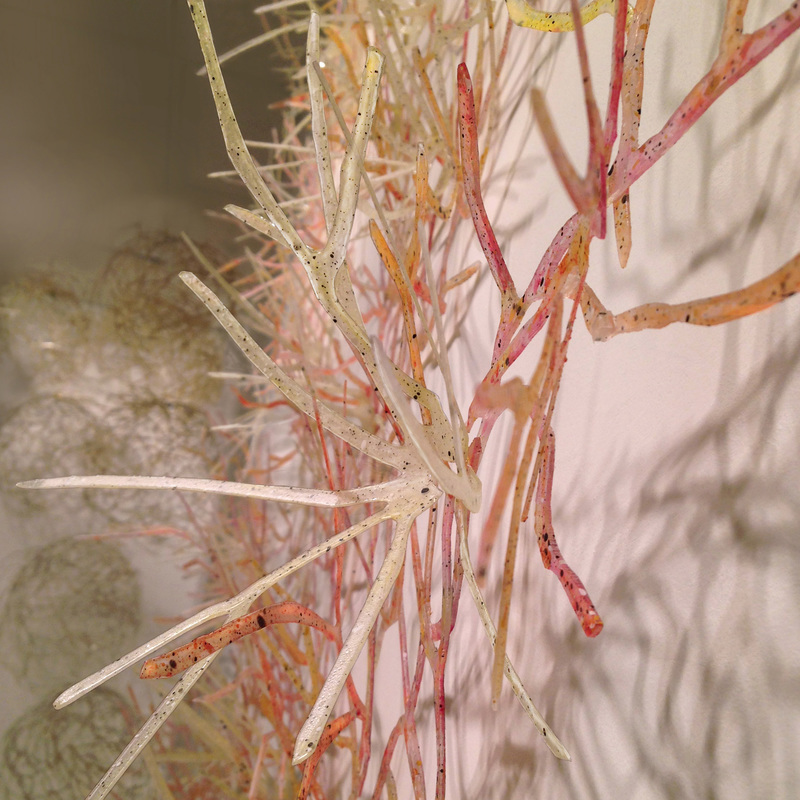 I am planning to create several artworks that address the ecosystems in these environments and their vulnerability. ​Your daughter, Margaux Crump, is also featured in this issue. What's it like having your daughter follow in your footsteps? ​Have you and Margaux collaborated or do you have plans to? ​No. We have never collaborated. Although I don’t rule it out completely. I find Margaux’s ideas and practice inspiring and creative. Sometimes, when we talk together about our work, I become really energized and ideas just start rolling in. Tell me about your current exhibits and your plans for your work in the coming year. ​In November of 2016, I have a solo exhibition at Manifest in Cincinnati. This contemporary space selects 8 artists from across North America for each annual exhibition season and I am thrilled to be a part of their programming. In early 2017, I will also have a three month long one-person exhibition at the Beeville Art Museum in south Texas. Later in the fall of 2017, I will have a solo exhibition at Camiba Art. This terrific gallery represents me in Austin. Regarding my upcoming work, I have two challenging installations already underway. 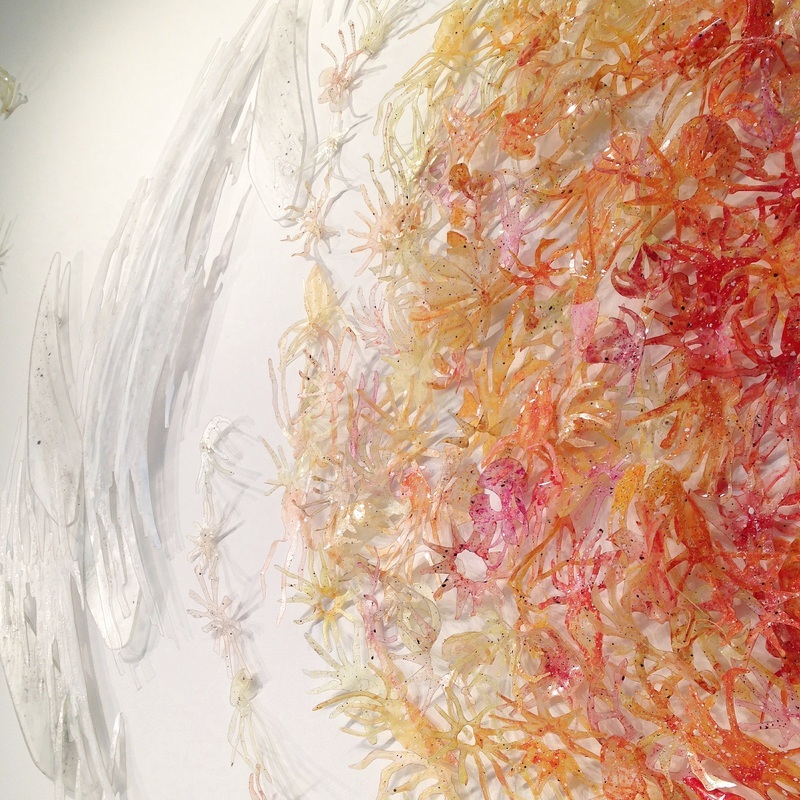 These artworks are inspired by glacial melt and dying coral reefs. One installation will hang entirely across an expanse of ceiling and the other will span a wall from ceiling to floor. What message do you have for our readers as far as the planet is concerned? I believe that the delicate environmental balance on Earth is really seriously threatened. It is so important to become as informed and to help inform others.